Why Aina Naseem, a Dell recruit, believes coming to FORE School of Management was the turning point of her life. There comes a point in life when you find yourself at the crossroads. The path you take can change the course of your long-term future. Aina found herself in that position after completing Bachelor’s in Commerce. She could have started her professional journey then. Instead she decided to further sharpen her skills before entering the world of business. That decision brought her to FORE School of Management, New Delhi. She says it was a turning point in her life. In two years she became a confident individual ready to take on serious professional responsibilities. 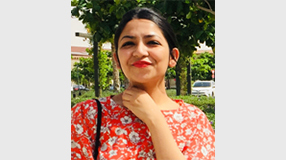 The learning experience paid dividends during placement: she was chosen for the role of Inside Sales Account Manager with a top international brand like Dell. Here’s the lowdown on her transformational journey with the B-School. What was going through your mind when you bagged the prestigious placement? A range of emotions: from sigh of relief to wanting to hug everyone around me. I realized that two years of hard work involving assignments, presentations, and projects had paid off. I immediately called my father because he has been a big influence in my life. Just watching him lead his life based on values has inspired me a lot. I was happy to get placed but happier still that his daughter had done it. Making him proud was the happiest feeling I have experienced. Can you tell us about the rigorous placement process involved with a recruiter like Dell? There were three rounds: group discussion and technical and HR interviews. During GD, I didn’t try to jump in to make my points. But when I did make them, I tried to speak sensibly. The HR interview was all about the summer internships and the live projects I had done. Since I had strong scores on my resume the interviewer mostly focused on my soft skills in the other round. My communication skills have improved in the last two years and that saw me through. The competition for placements is intense. What did you do differently to stand out and make your mark? I think people often get nervous trying to be their best selves. Not wanting to mess up, they put pressure on themselves. I used to do that earlier. For my Dell interview, I decided to let go. I was at ease and completely relaxed. I don’t know if my answers were the best but they were completely genuine. Being true to one’s self always helps. I also feel we should not underestimate the value of networking and relationships. You might face a few rejections, but don’t let them affect your spirit. Can you tell us more about your SIP experience and how it helped you during the placement process? I did my summer internship with Medlife International as a Corporate Sales Manager. The summer internship was discussed in both my interviews. I feel the internship experience made the interviewers look at me as the right candidate for the job. During the internship my role included meeting corporate clients, delivering presentations, and on-boarding clients for Medlife’s Corporate Benefit Programme. The internship exposure will definitely help me in my new job. So what is your job going to be like and are there any strategies that you have worked out for yourself? As an Inside Sales Account Manager with Dell, I am expected to handle direct sales for the company. I will be in touch with clients and will have to meet sales targets. I want to enter the corporate world with an open mind, as someone who is eager to learn and ready to adapt. I want to be a significant contributor to the organisation. I will have short-term goals. The idea would be to find out what I’m good at and pursue my aspirations.